At Home Animal Hospital in Kahului offers the most technologically advanced digital pet dentistry and comprehensive veterinary dental care on Maui. Our state of the art medical facilities and veterinarians provide advanced cleaning, evaluation, diagnostics and treatments so your pet can continue to get full use of their teeth while enjoying optimal health and wellness. Our newly updated digital dental x-ray provides unparalleled views of your pet’s teeth making it possible to detect problems both above and below the gum line before more dangerous conditions can occur. We are the only clinic on Maui which provides this important service. Pet dental care is an essential health and wellness procedure. Without professional dental care, bacteria in pets’ mouths may cause tooth decay, abscesses, loose teeth, jawbone loss, and painful gums that make chewing, eating, and living painful. Our veterinary dentistry in Maui recommends annual dental evaluations, and more frequent evaluations for small breeds and senior animals. We can detect abscesses, tumors, and other issues in their early stages, and recommend a course of treatment to remove the threat to your pet’s health. 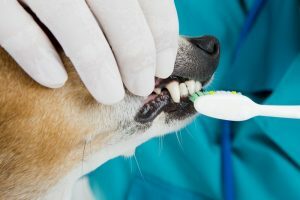 Regular cleanings get rid of even the toughest tartar, both above and below the gum line, to help protect your pet’s teeth and gums from bacterial infiltration. We are also able to advise you on home care practices to optimize your pet’s oral health between visits. For instance, we can show you how to brush your pet’s teeth as a means of keeping plaque buildup to a minimum. Dental extractions can be a standard and beneficial practice during the course of the dental procedure for pets when an affected tooth may not be transformed to a functional tooth. Dental extractions are sometimes required because of dental crowding, teeth compromised severly grinding, malocclusion, persistent deciduous teeth (baby teeth), among other medical reasons. Our veterinarian and dental technicians in Maui utilize similar dental care instruments as human dentists to remove calculus and plaque from pet’s teeth. Polishing with special dentistry paste is applied to smooth out scratches in the tooth enamel of your pet. Ultrasonic scaling effectively removes even the most stubborn tarter build up and staining leaving your pet’s teeth healthy and beautiful. Digital Dental X-rays (radiographies) may be acquired throughout your pet’s dental exam. X-rays help your pet’s dentist to determine whether or not the teeth’s roots are healthy, and to diagnose fractures, root abscess and impactions. Dental radiography is an effective procedure that can be used to detect problems such as cavities, tumors, and cysts which are not yet visible to the eye, but which will become problems in the future. With regular oral exams, cleanings, and X-Rays, threatening oral diseases can be detected sooner and treated more effectively with less trauma and cost. In order to conduct a digital X-ray, we must sedate your pet. Cats and dogs may also benefit from tartar-control foods, chew toys, dietary changes and pet dental care tips that help keep teeth cleaner and healthier. Contact our veterinary clinic to schedule a dental exam, cleaning and specialized treatments at your convenience.